Synopsis: With Andy now grown up and heading off to college, having not been played with for several years, the toys face a tricky decision, whether to remain in the attic or move on to pastures new, or more specifically: Daycare. 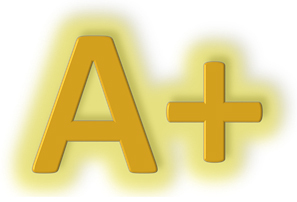 Review: When you have made two films, the first of which redefined the genre of animated movies, and then you followed that up with another supremely well made and heartfelt sequel that built so successfully on the world that its predecessor established, that is quite the feat. Therefore, when you decide to complete the trilogy, let’s just say that you have an almighty task ahead of you to try and top what came before it. 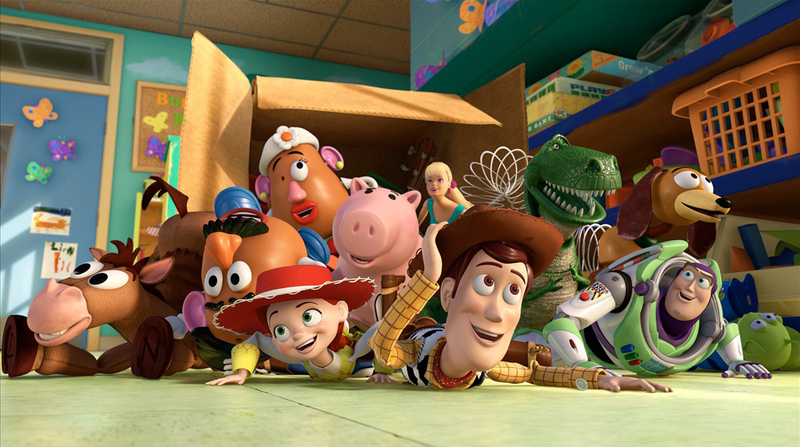 Leave it then to the animation powerhouses Pixar to complete their Toy-tastic trilogy in tremendous style! Toy Story 2 had quite the superb intro scene, but here they somehow top it with an incredible action scene of sorts that immediately reminds the audience that there is no limit to the imagination when it comes to a child and the toys they have, whilst immediately hitting you in the feels with the “You Got a Friend in Me!” tune, arguably one of the finest songs ever written for a Pixar film. 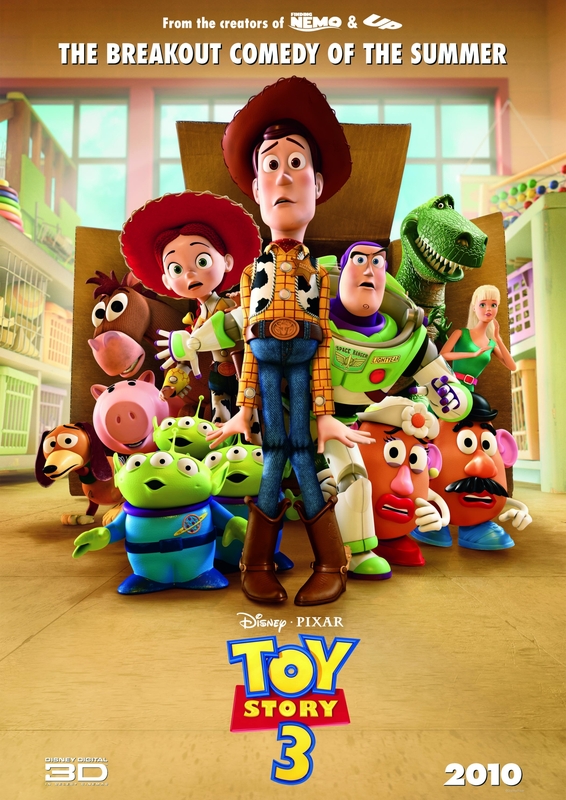 Though Pixar continues to make their films that work on both levels, it’s evident that this is a film that is geared towards those grew up with the first two movies, as they more than others will relate to the feeling of growing up and having that dilemma of what to do with the toys you once cherished more than anything else in your life. Yet as time progresses, that undying love, just slowly just fades away. Indeed, this is the very situation Andy finds himself in, what with being off to college and all. Despite a last ditch effort to get attention, Woody and the gang realise that maybe now is the time to find a new life for themselves or risk never getting played with ever again. through a mixture of unfortunate events sees the gang end up at a children’s daycare. Their excitement at a new lease of life quickly turns to horror though as these kids have a VERY different take on the word playtime, and life with Andy is a distant memory now. In Michael Arndt’s capable hands, the screenplay continues down the path that the first two films walked down. The characters continue to be well developed and compelling, including all of the gang you know and love with a couple of significant new additions. These being a Ken doll (voiced brilliantly by Michael Keaton) and Ned Beatty as Lots-O’-Huggin’ Bear (AKA Lotso) who is the leader if you will of the Daycare. Smell of strawberries he might, but he’s not as sweet as he comes across. The humour is also maintained throughout the film with a truly hilarious moment in which Buzz is once again convinced he’s a Space Ranger, except he’s gone a bit European! The dialogue is all vintage Pixar and it’s simply joyous to watch. Though the first two movies had plenty of emotion in them, there’s a couple of scenes here that really pack the emotion in such quantities that if it does not generate an emotional reaction among the watching audience, in which they’re fighting back the tears, one would have to question whether they are indeed human. Pixar films are littered with such moments, but two in particular here, might just be the best of the best. With a superb ending that continues to pack that emotional weight and one that wraps up this trilogy in just about the best way possible. Trilogies tend to have the one film that trips them up, but when a trilogy comes along, with each film being about as close to perfect as it could, that is a rare feat, and kudos to Disney and Pixar for pulling it off. It’s been quite the journey with Woody, Buzz and co, but as third films in trilogies go, this is one of those rare films that is as good, if not better than what preceded it. Another masterpiece from the brain boxes at Pixar.